Not sure where to attend college? BUA invites you to one of our Open House events. 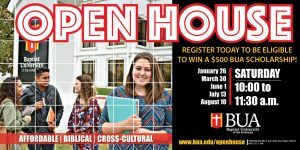 Come hear from other students, professors, staff and the president on how BUA is educating the next generation of cross-cultural Christian leaders. When you register and attend, you will be eligible to win a $500 scholarship for Spring 2019 or Fall 2019. Please click here to register for one of our open house days. We are located at 7838 Barlite Blvd, San Antonio, TX 78224 (across South San High School). For questions call 210.924.4338, ext. 202. BUA is a 4-year private university at $230 a semester hour (fees subject to change). Come learn about our scholarships, internships and work-study opportunities to help offset the cost of your education. Also hear about our affordable Student Housing. BUA is faith-based. We recognize God has a purpose for your life. At BUA you will find open, caring professors who love God and people. Our classes build lives through personalized, affordable, culturally affirming Christian education. We are cross-cultural. With today’s changing global environment, cross-cultural competency is a must. Learn how BUA is educating the next generation of cross-cultural Christian leaders to relate authentically with those of other cultures while respecting each person’s distinctive identity.